The attacker sustained the injury in the early stages of last night’s clash with Kildare in Croke Park. Ciaran Kilkenny after receiving treatment last night in Croke Park. CIARAN KILKENNY IS set to miss the rest of the season after tearing his cruciate ligament in action for Dublin last night. The news was confirmed today after Kilkenny underwent a scan on his left knee and it was diagnosed as an ACL rupture. Dublin GAA officials confirmed the news in an official statement. Kilkenny limped off in the early stages of Dublin’s league win over Kildare and the injury is a major setback for the talented young attacker. Manager Jim Gavin wished the Castleknock clubman well in his recovery. “On a personal level this is very frustrating for Ciarán who has played a vital role in the recent success’s in both football and hurling for his county and club at all grades . Protocols have been activated to ensure that Ciarán will receive the best of medical care and the Dublin football coaching staff will actively assist Ciarán in his recovery over the weeks and months ahead. “We wish Ciarán a speedy recovery and look forward to seeing him back to full health in the near future”. Email “Setback for Dublin as Ciaran Kilkenny tears cruciate ligament”. 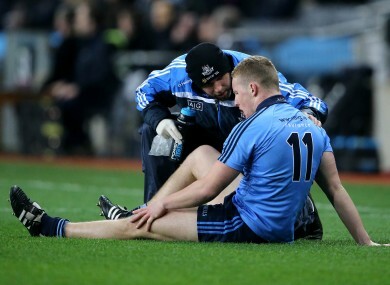 Feedback on “Setback for Dublin as Ciaran Kilkenny tears cruciate ligament”.